Late referrals to hospice drive up end-of-life costs and limit benefits for patients. By contrast, about 42 percent of dialysis patients who used hospice were enrolled for three days or less, the researchers found. 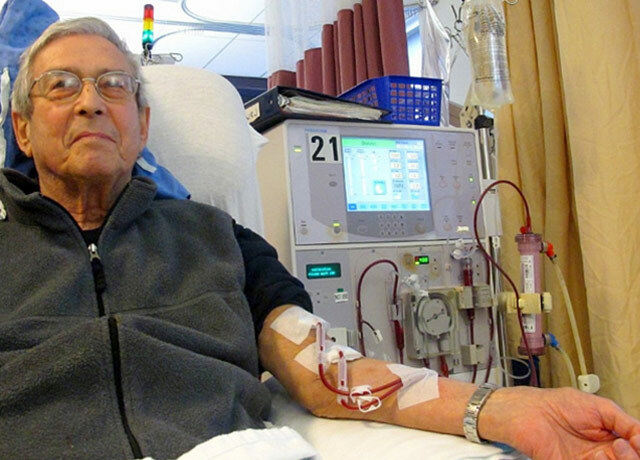 As they approach the end of their lives, many patients with end-stage renal disease face a harrowing choice: Continue dialysis treatment or enter hospice care. Medicare currently will not pay simultaneously for dialysis and hospice care for patients with a terminal diagnosis of renal failure. Patients who want hospice care usually must first halt the dialysis treatments that keep them alive. A study published today in JAMA Internal Medicine found that, nationally, only 20 percent of Medicare patients with end-stage renal disease had used hospice prior to death, and those who had were almost twice as likely to have very short hospice stays (three days or less), compared with patients with other advanced chronic illnesses. “These findings argue for greater flexibility in hospice-entry criteria for this population,” said senior author Ann O’Hare. She is a professor of medicine at the University of Washington School of Medicine and a physician-scientist at the Kidney Research Institute, a collaboration between Northwest Kidney Centers and UW Medicine. Melissa Wachterman, left, of Brigham and Women's Hospital in Boston, and Ann O'Hare of the Kidney Research Institute in Seattle were lead and senior authors, respectively. Hospice, covered by Medicare, Medicaid and most private insurers, is a benefit available to persons with a life expectancy of six months or less. Hospice has been associated with enhanced patient and family quality of life, healthier bereavement, and reduced medical costs as compared with patients who die without such care. Nationally, almost 50 percent of people on Medicare who died received hospice care, with a median length of stay of 23 days and an average of 70 days. By contrast, about 42 percent of dialysis patients who used hospice were enrolled for three days or less, the researchers found. “These short stays make it very difficult for patients dying of kidney disease and their families to fully benefit from the expertise in pain and symptom management that hospice can offer and the emotional support that hospice can provide,” said lead author Melissa Wachterman, a physician at Brigham and Women’s Hospital in Boston. Some people with end-stage renal disease see it as a blessing that they can control when they die, by deciding to stop their dialysis treatments, O’Hare said. Other patients, though, may not be quite ready to stop dialysis to enter hospice, especially if dialysis is providing symptom relief. Medicare's requirement to halt dialysis before hospice leads some patients to forgo hospice entirely. Patients on maintenance dialysis generally receive very intensive care toward the end of life. For those who don’t receive hospice and instead pursue care focused on prolonging life, the costs of being in an intensive care unit, on a ventilator, with round-the-clock monitoring, are very high. The study results, by contrast, associated progressively longer hospice stays with reduced end-of-life costs and intensity of care. “We hope our work will spark discussions about potential changes to Medicare policy to better serve the needs of the ever-growing population with end-stage renal disease,” said Wachterman. The authors also cited the value of giving renal-failure patients earlier access to palliative care, which might smooth the transition, later, to hospice. Palliative care is similar to hospice inasmuch as it involves addressing issues important to people with a life-threatening illness, but can be provided earlier in the illness trajectory and without the rigid entry criteria. This study was supported by a grant from the National Institute of Diabetes and Digestive and Kidney Diseases. Wachterman also received support from career development awards from the National Palliative Care Research Center and the National Institute on Aging.